Delighted with this special honour, CEO of TrendLoud - Mr. Chidambaram said, “At this moment, would like to thank TalentTrack, Ernest & Young and other Jury members for this award. It's indeed a great motivation for us to produce many more quality originals in the coming years”. He also extended a special note of thanks to Viu for the association in producing this series. “Thanks to Vishal for his guidance and support. Door No. 403 remains special to us - it was our fifth production and now we have grown and have rolled out our tenth series,” he concluded. The Chennai-based company’s web series stood tall in a talent pool comprising of Amazon's Mirzapur who won a silver & Netflix's highly-acclaimed Scared Games, which won gold. 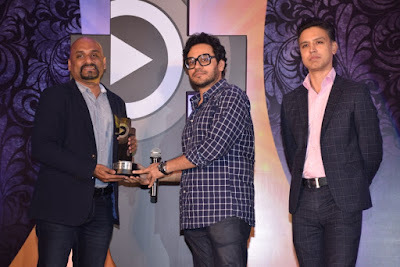 Mr.Chidambaram, CEO of TrendLoud receiving the award from Siddharth Jain, Chief Storyteller, The Story Ink.